I don’t know what else to call this, but they seem to be popular currently. I have not seen any with the music buttons, but the little security blankets with stuffed animal heads seem to be everywhere. My Grandson had a couple and he loves them, so I wanted to make him one. He loves musical things and sounds so I also thought he would enjoy one that played a song. A music box would make it too heavy, so I decided a music button would be a better choice. This is really simple. 2 pieces of fabric (about 18X18 inches altho you can make this whatever size you want, obviously). Remember to allow for seams –that is if you cut it exactly 18X18 inches your finished blanket will be a little smaller than that. Not that it really matters. 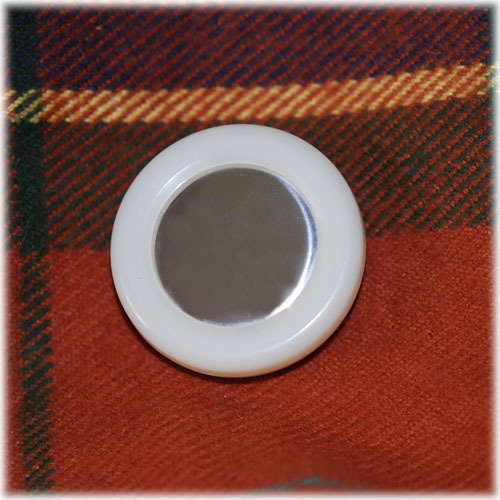 music button –I ordered mine from Ebay and got a great deal from someone selling a bunch of music boxes and music buttons. You can look around the internet, they are not hard to find. You might be able to find them at a craft store locally, I couldn’t find them around here, but I can rarely find anything out of the ordinary here. batting to stuff the head and stuff around the music button. thread to embroidery the eyes and nose. I made the head first. I usually draw out a pattern for things like this on paper, cut it out and use that, but I didn’t this time. I just started cutting on my fabric. 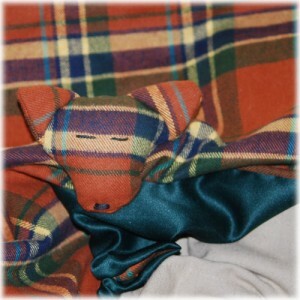 I had some small pieces from the stuffed fox I had made for my grandson and so I felt brave, since if it didn’t turn out I could just toss it and try making a template instead. However, I liked it as it was. The ears were a little tricky, but I just cut out 4 layers of fabric into triangles (so they would be basically the same, altho when I sewed them up they weren’t *quite* identical –oh well, real animals are not quite perfect either!). I stitched the ears together on 2 sides, leaving the bottom open and stuck some flat quilt batting in to make them a little stiff. Turn it right side through the opening (be sure to leave enough opening to pull the ears through!). Stuff it with batting. I used more of the flat quilt batting torn into pieces because I have a bunch small pieces leftover from another project. Stitch up the opening where you stuffed it and make sure you don’t have any spots the machine missed (it’s a little difficult to stitch around the ears, at least it was for me, and it’s easy to hand stitch any spots that were missed. Since this is a child’s toy you want it to be sturdy). I used a satin stitch (I think) and a heavy black thread I have to embroider a nose and a simple stem stitch (I think!) for the eyes. I used to do a lot of crewel work, but I cannot recall the names of any stitches anymore. I barely remember how to do any stitches. 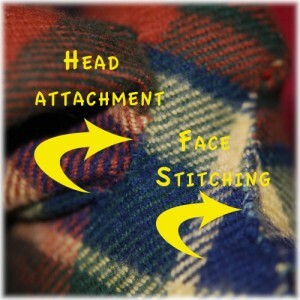 If you are unsure how to do any of this you can find help online by searching embroidery stitches. Just don’t use buttons for an infant as those can be torn off and cause choking. I think leaving the nose and eyes off would also be fine. Simply stitch around the edges (straight as you can!) with the right sides facing each other. Leave an opening about 2 inches in one corner. Turn the blanket right side. 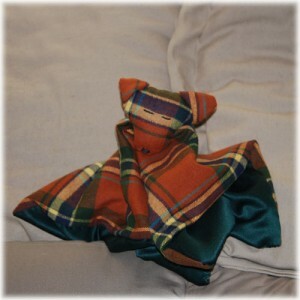 I thought about putting quilt batting into this, but it’s supposed to be a cuddly blankie, not a quilt, so I didn’t. The hardest part is putting the music button in. I made a little pocket for the button because I wanted to pad it. They are a little hard and this is supposed to be a cuddly toy. 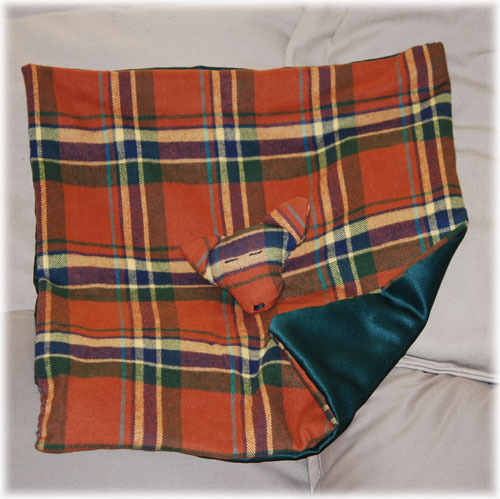 I used some leftover plaid fabric, stitched up 3 sides, put the button inside, stuffed some of the extra batting inside until it was soft enough but not too fat and stitched up the open end. I made sure to leave some extra fabric on the edge of the pocket to sew into the seam of the corner when I stitched up the opening of the blanket to keep it from just wandering around in there. Stick the pocket with the music button into the open corner of the blanket. Turn under the edges of the fabric (make sure everything lines up, I probably don’t have to say that, but sometimes I forget little things like that and have to undo and redo things!) and start sewing the opening up, making sure to catch the edge of the music button pocket in the seam. My hand sewing is not beautiful, but it didn’t look too bad. It probably would look even better if you put a satin border around the edge, but that’s probably beyond my skill level at this point. You can see from the bottom photo that it’s not perfect, most of you can probably do a much better job. But, mine definitely looks “hand made”. Finally, attach the head. I hand stitched it, simply going around in a circle and hand stitching it to the top fabric only. It was a little tedious as I had to keep making sure I didn’t catch the bottom fabric. In hind sight, I’m not sure it wouldn’t have been better to stitch it to both fabrics, however, my stitching is not that pretty, so I’m not sure I would have liked the way it looked. As it turns out, I ended up deciding to machine stitch the two layers together anyway, just a quick straight stitch about 2 inches just above where the head is. I wish I had done that before I put the head on. If I do another of these, I will do it that way. Oh, just brilliant! I love the fox’s cute face, and the music is a cute addition, I can imagine any child loving it. Wow I really was out of it last year, I missed this one completely and it is soooooo cute!!! !